When we moved into our current house, a guest bedroom was on my must-have list. could come and stay for extended periods of time. including the bottom of my sons bunk set (a double bed/single combo set). well he is 10 now and quickly outgrowing the twin. and give him the space he needs. That leaves us with the issue of needing a bed for the guests. from the last homeowners up still...just maybe!). simple, classic and chic! My guests would be so happy on a bed like this. 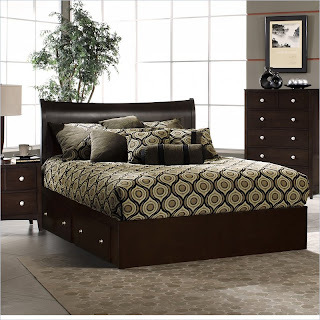 Better yet, I discovered a huge selection of platform beds with storage. Form + function - perfection! The design is classic, the storage amazing, and a great price! the craziness of the rest of the house. Well, I am feeling a little guilty, maybe my son just needs a new bed. (he's been asking for a big boy room for year now). room for all of his treasures and books and, well, stuff! Man, my house is in transition right now...hope I can keep up! Is there anything special you do for your guests? Ummm... answer the door? Okay, that's just wrong. These are gorgeous. The main thing I always do is be sure to offer reading materials, a great beside reading light and table! Hope your Memorial Day weekend is going swell. That first Blue & White bedroom is perfect. I LOVE that bed! I prefer light and airy looks in a bedroom. I make Sour Cream Coffeecake or muffins or cinnamon rolls and fresh brewed coffee for my guests in the morning. I'll also do dinner and lunch several times during their stay, it depends upon their schedule. I'm working on making the room better and your post is very inspirational! Unfortunately we don't have room for guests to stay with us. We barely have enough room for us. I love all of these beds. They look amazing. I would love the bookcase bed fir my son. I am redoing his room this summer. I really want to have this bed. 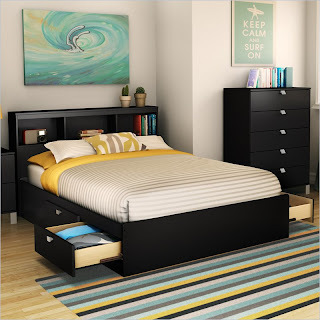 This bed is suitable for people who want to have a bed with storage drawers. I want to have this bed with the white color because I loved white color. Your guest room bedroom concepts are amazing. I would like to incorporate a little bit of all into a good design. The one from Espresso Finish is really eye-catching. It makes me think of my blended coffee with its green and brown design.